A nativity scene may not be the first thing that comes to mind when one thinks of the Second World War collections held by National Museums Scotland, but I’d like to share with you this delightful set of figures made by a Polish soldier serving in Scotland during World War Two. 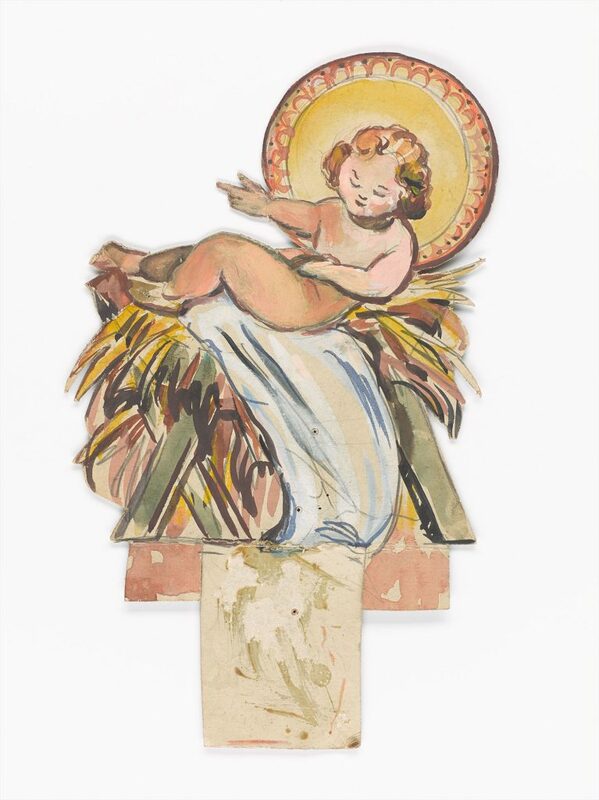 The beautiful hand-cut card and hand-painted nativity scene was made in Scotland around 1943 by Stanislaw Przespolewski. Stanislaw Kajetan Przespolewski was born in Warsaw, Poland in 1910 and having shown great artistic talent in school, went on to study at the Krakow Academy of Fine Arts. He then took some classes at the Vienna Kunstgewerbeschule (the Vienna School of Arts and Crafts) and had been preparing an exhibition that was interrupted by the outbreak of war. Like so many of his countrymen, after Germany’s invasion of Poland, followed by the Soviet invasion in September 1939, Stanislaw left Poland. The Polish Government-in-exile was based in Britain, as was a large part of their military force and security services. 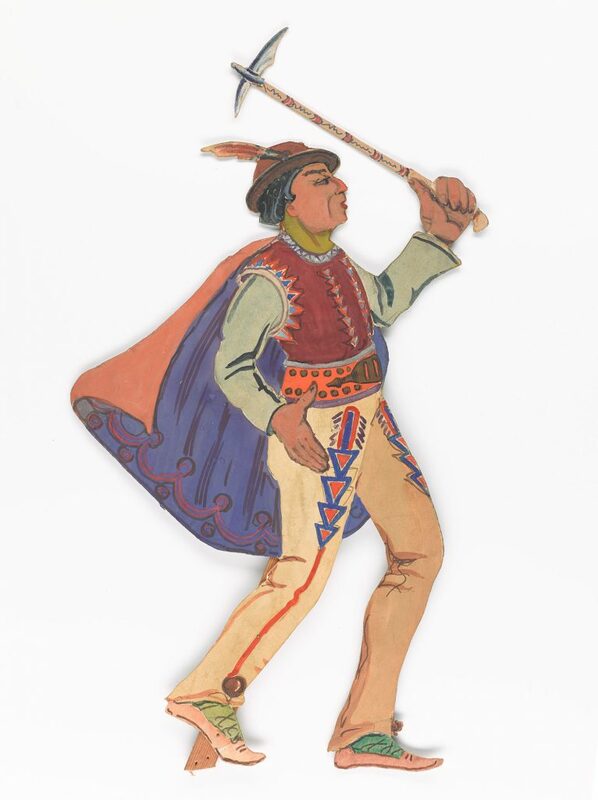 According to Stanislaw’s family, after leaving Poland in 1939 he and his siblings travelled to Hungary and then by boat from Yugoslavia to France, where he joined the Polish Army in the West. Fierce fighting in France drove the Polish Army to Britain and Przespolewski found himself in Scotland, where he was stationed for some time with the Polish Armed Forces in the West in various locations around Scotland. 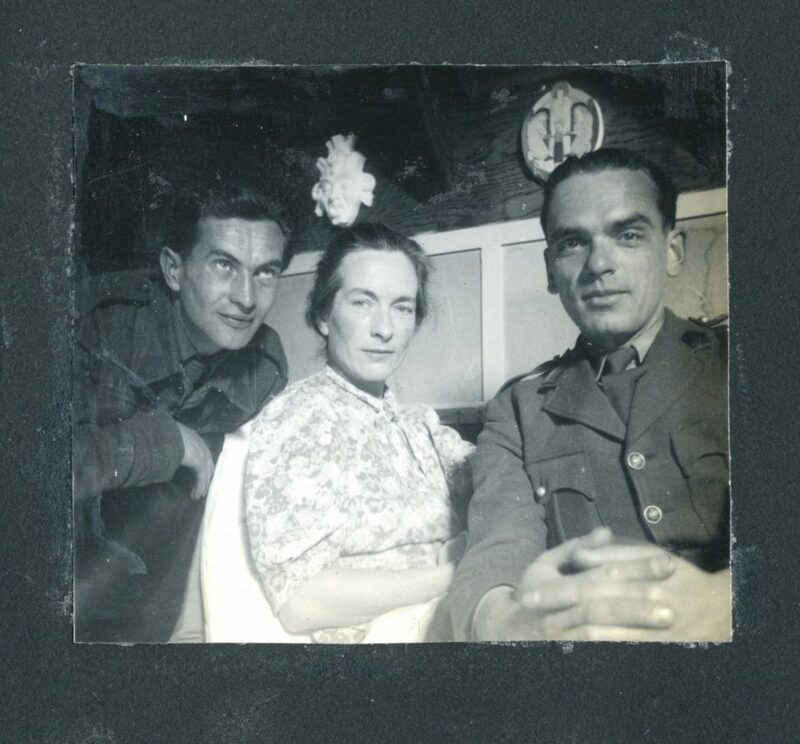 In Scotland, he met Józef Sękalski – another Pole in exile and a fellow soldier – in St Andrews, Fife. He and his partner Roberta Hodges were also both talented artists. At Roberta’s studio in the attic of The Bell Rock House, Stanislaw painted a number of portraits, nudes, still lifes and landscapes. Photographs from these days show a young man at ease with his friends. 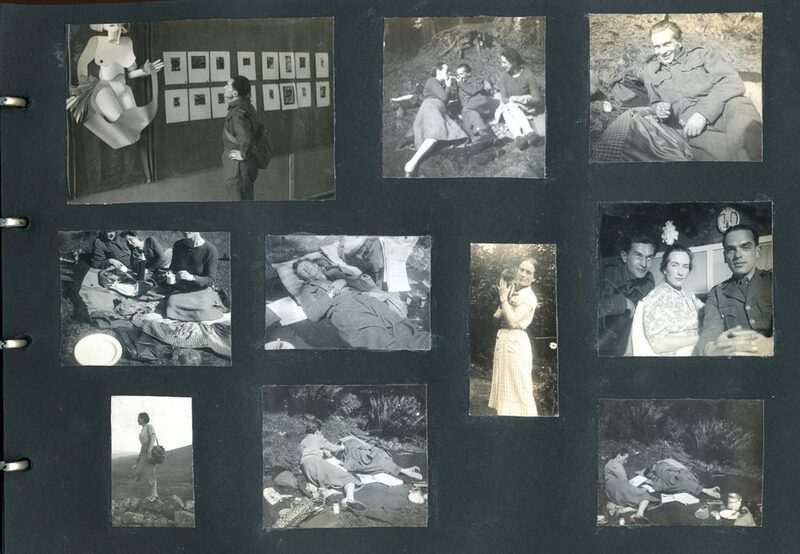 Photos of Stanislaw, Roberta and Joseph from Stanislaw’s collection. From 1944 onwards he was one of the Polish combatants in the 1st Polish Armoured Division and advanced from Normandy to Wilhelmshaven in May 1945. It was during this time he met and married the Belgian-Dutch artist Jeanne Prisse (1921–2008). Despite the Allied victory in Europe in 1945, many Poles remained in exile, unable to return to Soviet-dominated Poland. The couple moved to Salford (near Manchester, England) where after the war he had a number of odd jobs and appointments as a designer for the ceramic industries. Later they moved to the Netherlands, where they set up a studio to paint, design and produce pottery, and it was from here that, after his death in 1988, his wife Jeanne sent over to the National War Museum a selection of his work that was connected to his stay in Scotland, including this nativity scene. 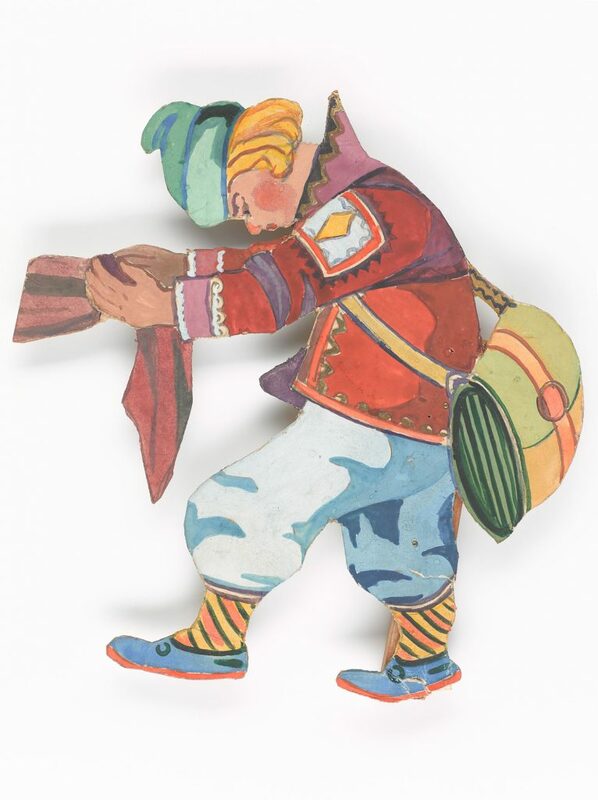 In Krakow, the tradition is to make Szopka, elaborate three-dimensional nativity scenes. Interestingly, this version is more than just a representation of a typical nativity scene, which would show the Holy family, the Magi and the shepherds. This nativity covers many Polish traditions from the Wigilia or Christmas Eve, the birth of Christ in the stable on Christmas day, St Stephen’s day (Boxing Day) – a day of going out into the community dressed up as shepherds, knights, angels and devils to exchange Christmas greetings on 26 December – all the way through to the visit to the Holy family by the Magi in the festival of the Three Kings on 6 January. 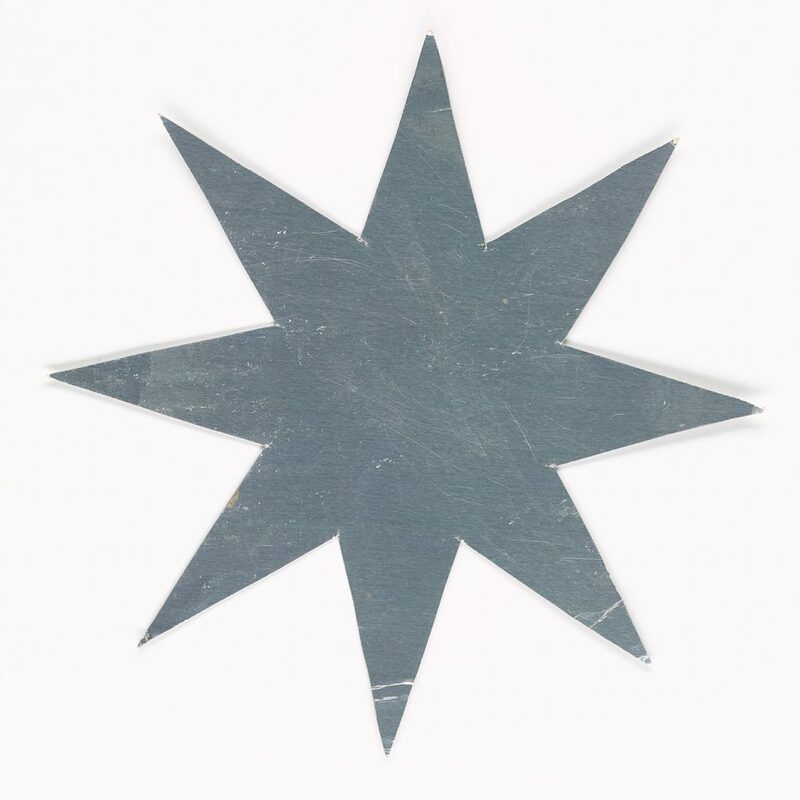 The star showing the way to the manger. The infant Jesus, in the manger. 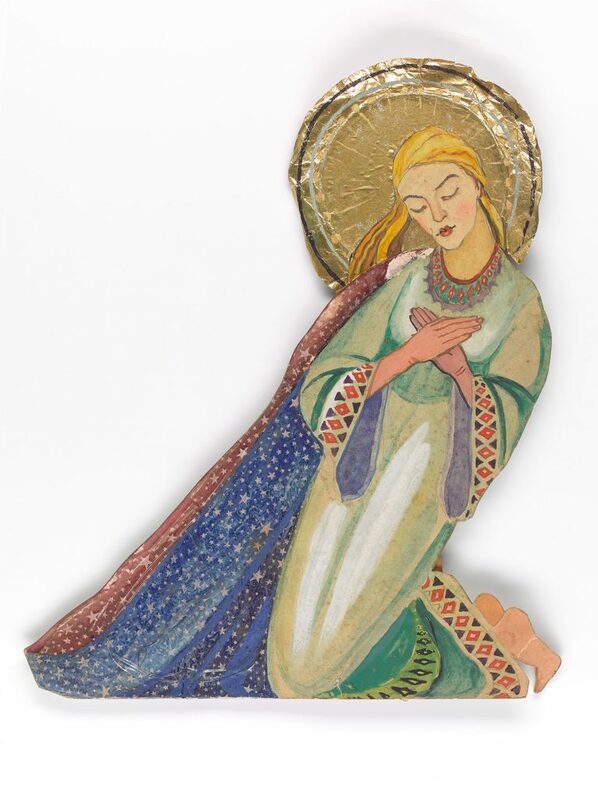 Mary praying, clad in a cape of stars and a dress embroidered with Polish folk costume patterns. 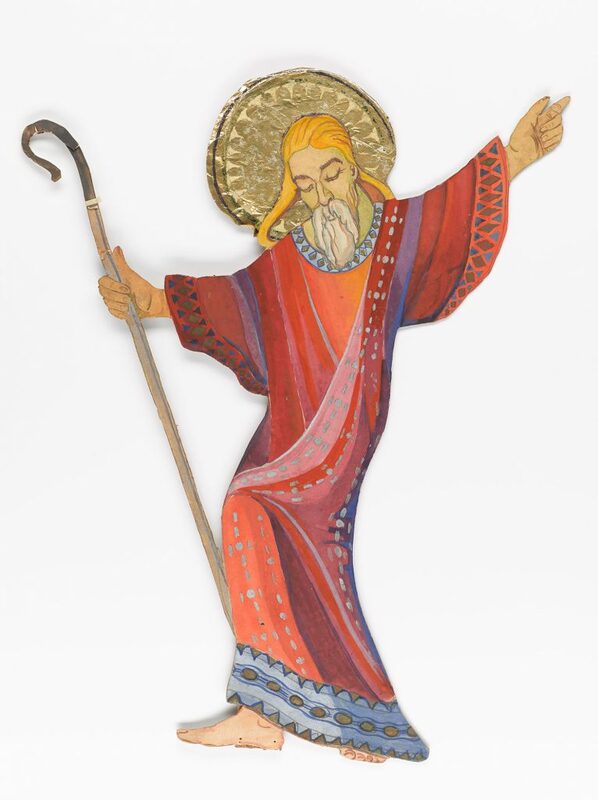 Joseph, shown standing, holding a shepherds crook, arm outstretched in blessing. 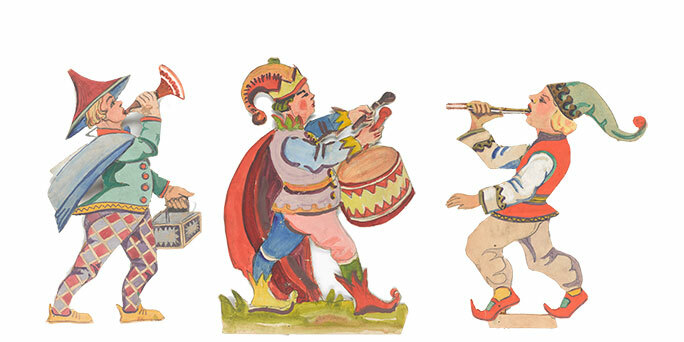 The Magi – these are shown here as three merchant types bearing gifts. Balthasar brings Myrrh suspended in a container. Melchior brings Gold, he is the oldest of the Magi, thought to have been the king of Persia, and Caspar shown as a beardless man brings Frankincense. 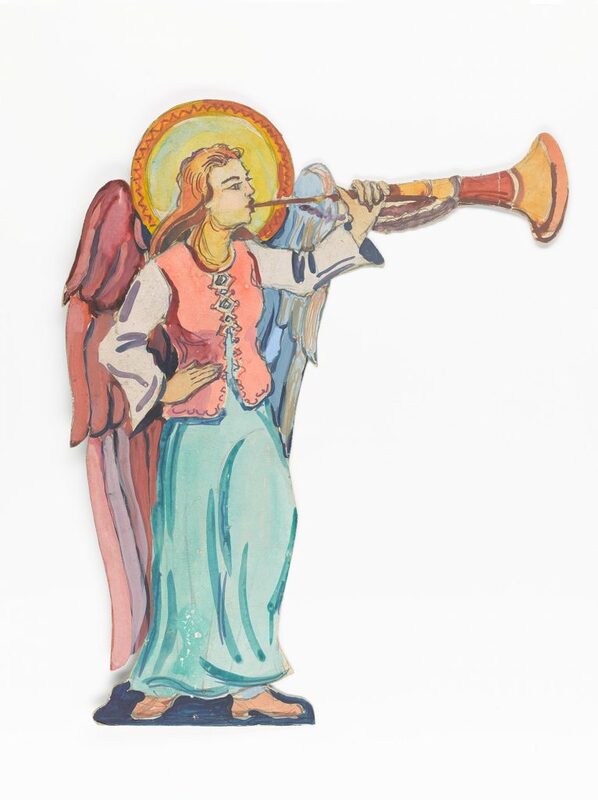 The Angel blows her trumpet heralding the coming of Jesus. 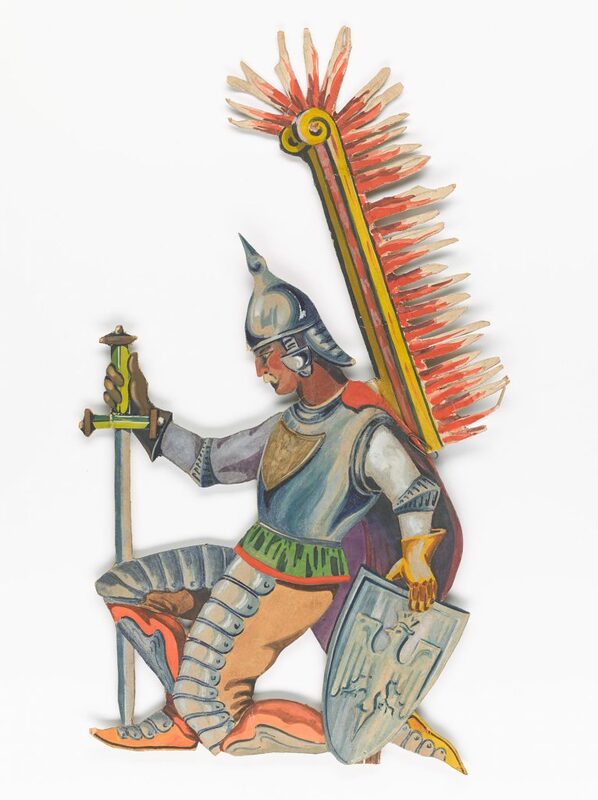 The knight – a winged hussar – a type of Polish soldier dating from the 16th century. A Goral highlander in traditional costume carrying his shepherd’s axe. 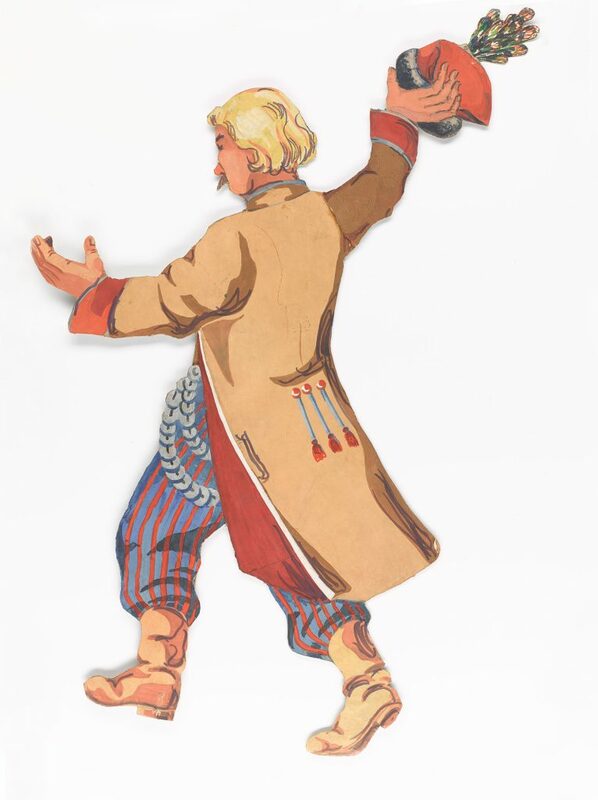 Krakow men’s folk costume showing the decorative belt of metal discs. Three boys – traditionally in Poland children dress up and sing traditional songs as they process around their neighborhood on St Stephen’s day. A boy, dressed in traditional costume, proffers a gift to the infant Christ. 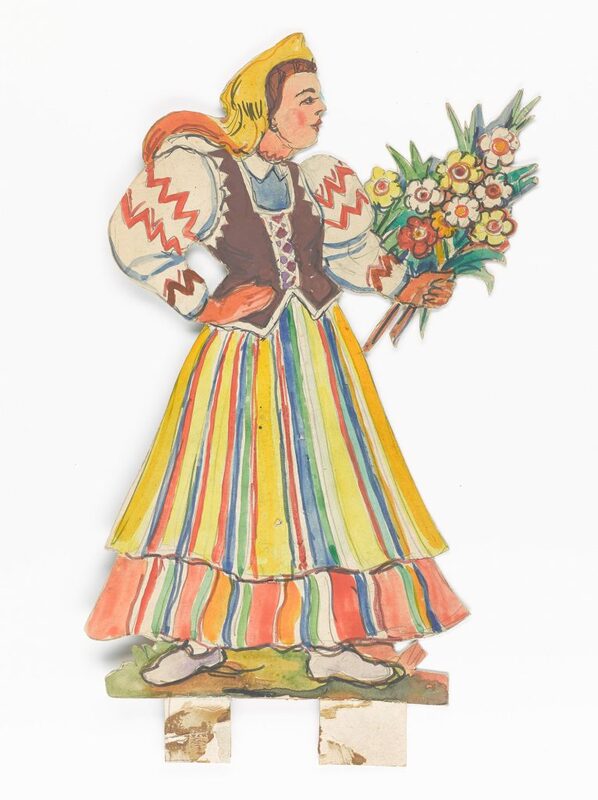 A flower bearing woman in a folk costume of central Poland. 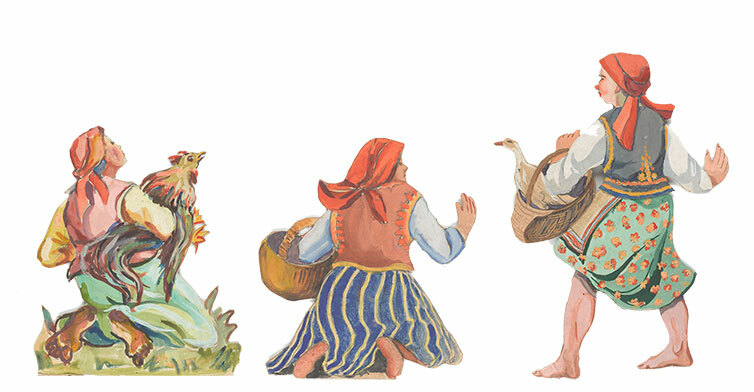 Barefoot peasant women; one with a cockerel, one with an empty basket and one with a goose, bringing what they can to the infant Jesus. 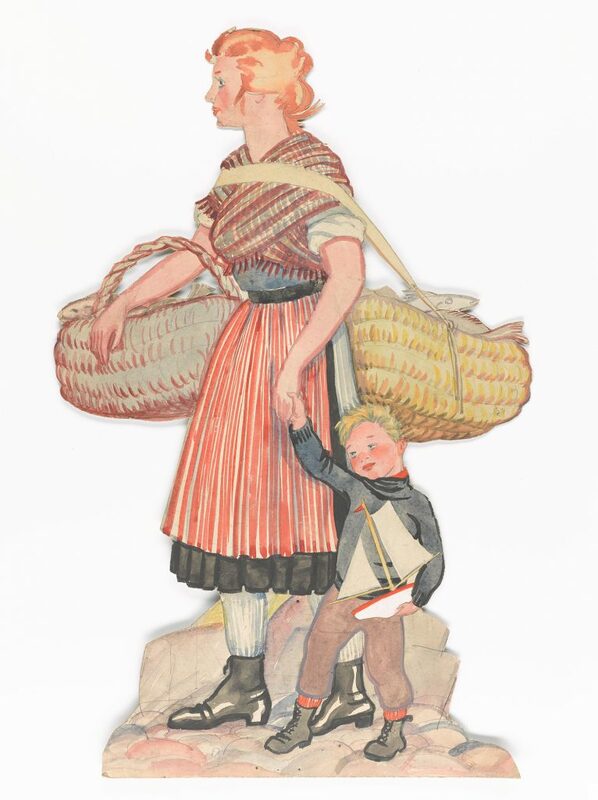 Scottish Fisher lass and her child, carrying a creel of fish, wearing her striped skirts and wrapper shawl. The child is wearing a ganzie (woollen jumper) and carrying a toy boat, as was very popular with fisher children. The knight’s horse in its embroidered bridle and saddle. St Stephens’s day (Boxing Day) is a day of great festivities and St Stephen is the patron saint of horses. 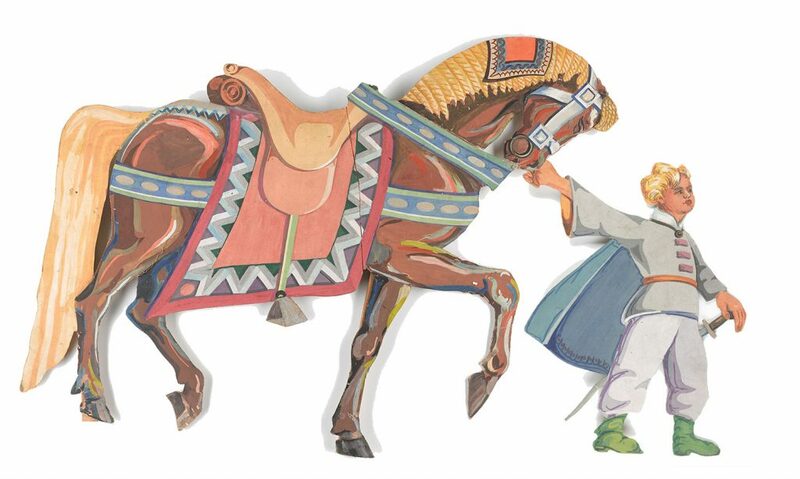 The child leading the horse dressed is in traditional costume. Cattle. The ox is present in traditional nativity scenes but this may refer to the Polish New Year’s Day custom of baking bread in animal shapes, cattle, sheep, geese, rabbits to gift to children. 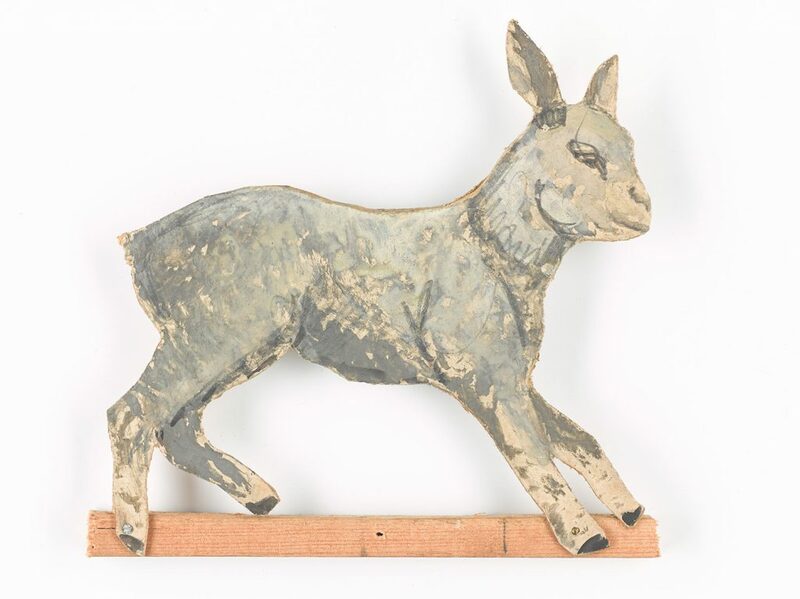 A lamb, a tradition emblem from Nativity scenes, at once representing Christ (the lamb of God) and as one of the flock belonging to the shepherds. 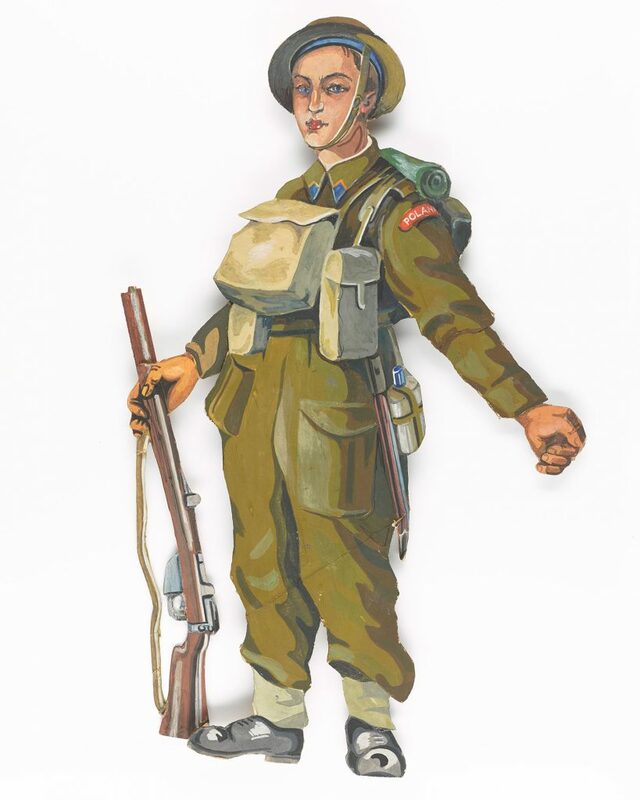 A Polish Soldier in the uniform of the Second World War. 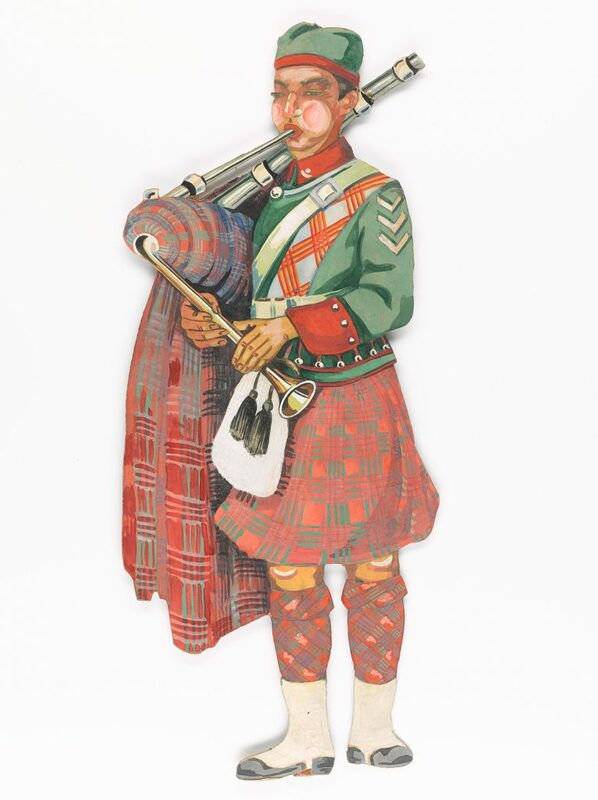 A bagpiper, possibly inspired by the pipe bands which some Polish army units formed during their time in Scotland. This nativity scene is a touching recreation of a Polish Christmas tradition by one Polish soldier in exile from his home, his country and his family whilst stationed in wartime Scotland. So, wherever you find yourself, and however you celebrate this time of year, we’d like to wish you all a very happy festive season! You can find out more about Polish battalions in Scotland at the Polish Scottish Heritage website. You can discover more about our military collections at the National War Museum at Edinburgh Castle. 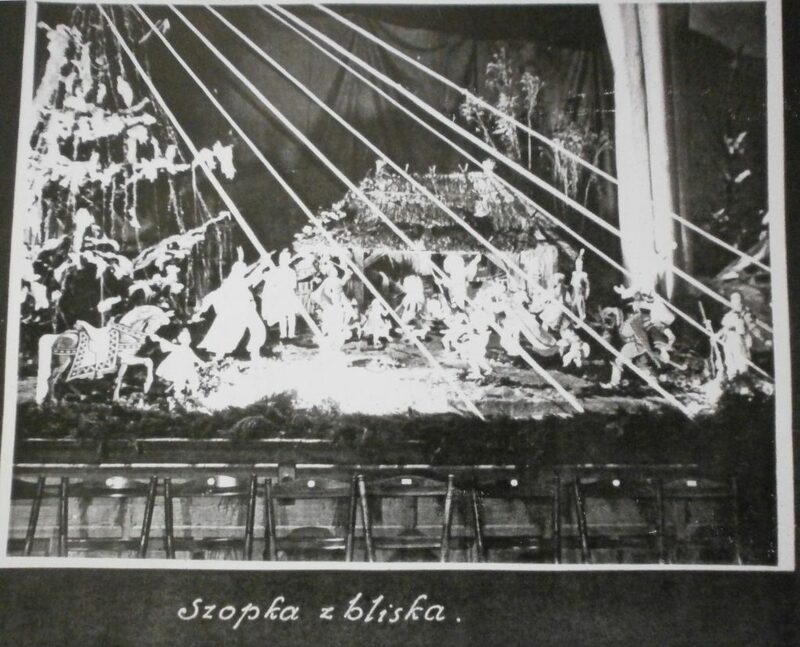 I was very interested to read this blog and to see pictures of Roberta and Joseph Sekalski. I am in the process of compiling a blog about the late Barbara Robertson, and artist an printmaker who was taught by Joseph at Dundee College of Art in the 1960’s. It would be of great benefit to my blog if I might use these images in a section dealing with Joseph Sekalski and his time at Dundee. Would you have any objection to this? I would of course credit the source.